My 6th-grade child piped up one day and said “I want to go to Baker,” meaning Baker Charter School that his longtime school friend enrolled in. I, as a busy working mother of two active teenagers, responded with, “No, we are not going to homeschool.” As the year passed, and another year began again, my son said, “I want to go to Baker.” And I responded again with, “No we are not going to homeschool.” As seasons passed and fall began, my tenacious son again requested that he wanted to go to Baker, and again I replied, “No, we are not going to go to homeschool.” At this time 9th grade was quickly approaching, and it was time to move on to the high school environment. A busy week before school started, my son declared, “I am not going to THAT school.” “Oh, ok,” I replied. “I guess we're going to Baker.” That day I signed him up and began a journey I will never regret. 3 years later we are still with Baker and happier than ever. My son's 9th-grade year unknowingly prepared him well for his early college experience. Baker Charter's School encouraged independent learning with individualized education. As far as our family experience with Baker went, my husband was retired so he could attend all of the advising meetings keeping us informed and updated on our son's status. Trust me when I say, my husband knows nothing--I mean nothing--about technology, and my son excelled academically and independently. As his first year progressed with lots of learning curves, maneuvering thru the technology programs, and learning the many operational features, we finally got settled in. 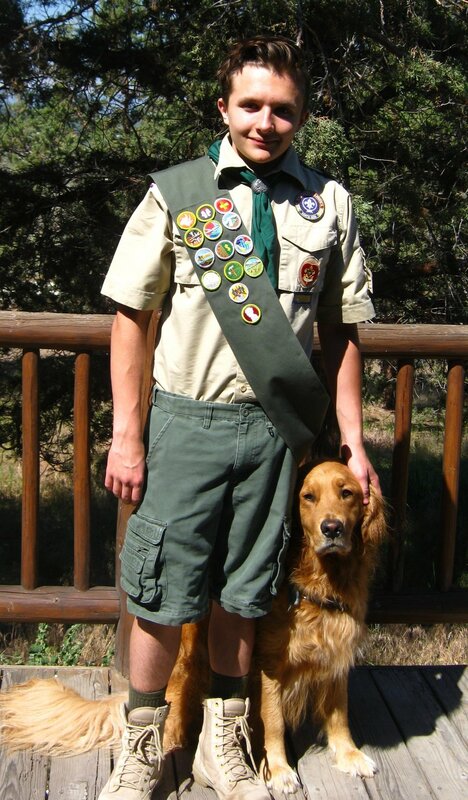 Here is Wyatt in his Boy Scout uniform with his dog "Bjorn". January, same conversation. In hindsight, I know that these requests were correlating with his advising meetings. Come February, my husband requested that I go to the open house for Baker Early College and just keep an open mind. As with all the other requests, he continues to request to live in the dorms. At this time he isn’t living in the dorms. I think I get to keep him home for one more year but I also think the requests will keep coming. Baker Charters School has helped my son become the individual he is today, and the program has fit him well. It's the best education he could have ever received.